We should be sleeping approximately one third of our life. There are 24 hours in a day and we should be sleeping approximately 8 hours a night. In addition, the most important hours to sleep are the hours before midnight. A good night’s sleep will be from 10 pm to 6 am. When the winter comes, we should actually be sleeping more because the sun goes down earlier. For example I sleep 7 hours in the summer and 8 hours in the winter. Many of my patients tell me that they stay up late watching TV or playing on the computer when they should be in bed sleeping. 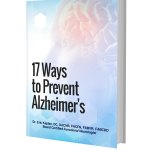 This will lead to anxiety and an increase in stress levels which will affect the brain and can be one of the contributing factors in memory loss. In addition researchers found one of the easiest solutions to weight loss is going to bed at least two hours before midnight. So not only can you prevent memory loss by going to bed earlier but also you will lose weight. That is not a bad side effect. The key is to get into a really deep sleep which is called REM. We should not wake up in the middle of the night to pee or to roll over or to check the alarm clock. We should wake up in the morning saying “How long have I been out?” “Where am I?” or even “What day is it?” That is a deep sleep. We should also wake up on our own and not to an alarm clock. The best way to get to sleep early is to not eat late at night. I do what is called intermittent fasting where I eat from 9 am to 5 pm. The purpose of eating is to accumulate energy so you do not want to eat late at night to give yourself more energy which will make falling and staying asleep more difficult. It’s also important not to use any electronics past 5 pm. Once you clock out of work put the electronics away. They have blue light which stimulates cortisol production which is the stress hormone that will only worsen your sleep. While you sleep turn off your Wi-Fi and cell phone. 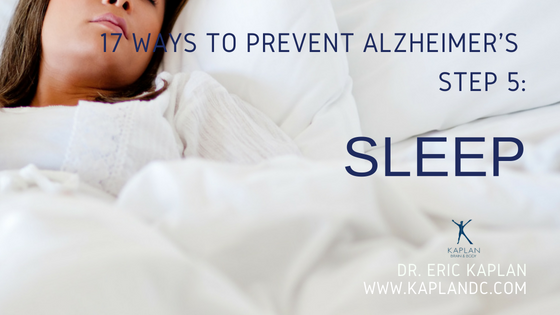 If you follow these directions you will get a good night’s sleep which will help rejuvenate and re-oxygenate your brain to keep it healthy and prevent Alzheimer’s disease.